Jessica Rodriquez has always used social media as a way to share her story. It’s an outlet she’s tried out blogs on, different businesses and the more she would share the more she’d realize she wasn’t alone. When she shared her story about why she has a semicolon tattoo on her body, she saw a much bigger and more powerful way to share a message through social media. 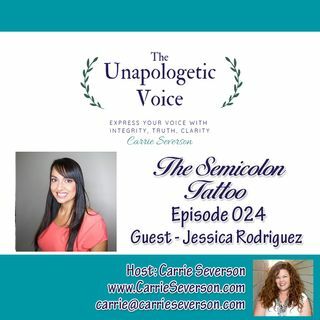 Her podcast is: https://jessicarodriguez.kartra.com/page/podcast and you can learn more ... See More about the semicolon project here https://projectsemicolon.com/. As always, if you have a message that is ready to get out into the world, check in with Carrie at www.carrieseverson.com to see what she has out in the world that might support you and your mission.